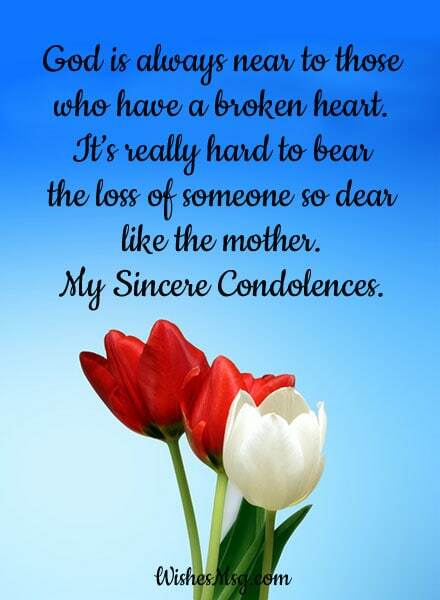 Condolence Messages On Death Of Mother : Sometimes life presents us with some sad moments. Like the death of our beloved ones. It’s so obvious that every one of us will die one day. But still, we mourn for each one of those who leaves us forever. This loss is very painful. 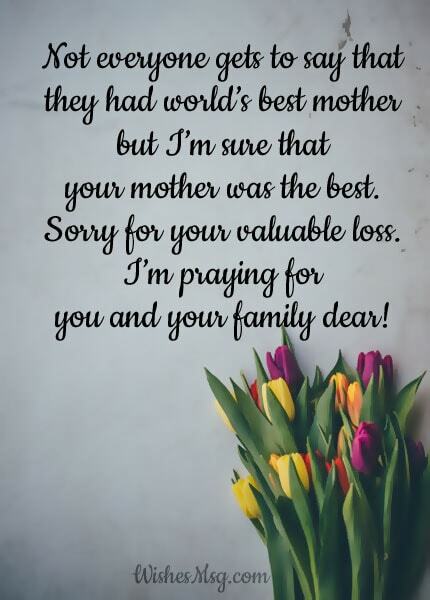 It’s even more difficult to find some comforting words for your friends or close ones who just have lost their mother. Dealing with this great pain of grieving is not easy for them. You may like to send a sympathy card, heartfelt note or condolence message to comfort them. 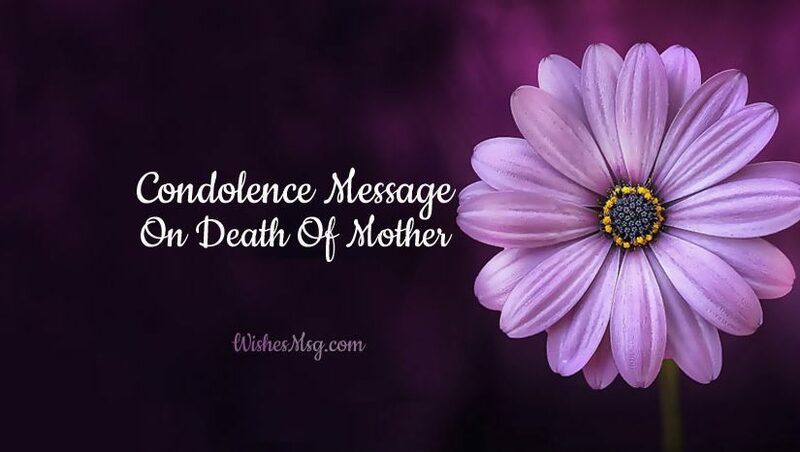 Here is some condolence message on death of mother so you can condole your grieving friend who just has lost his mother. Let him know you are with him in his sad moments and always will be. Keep him strong in such a difficult to bear situation. No person is born for forever. Sometimes God takes our examination by giving pain and a hard time but I know you have the ability to face any situation. Sorry for your mother’s death! Every person who is born will die one day. We all know that parents are always at the top of our loved list. Losing one of them is like the world’s end. Extremely sorry for your mother’s death dear! Please accept our sincere condolence for the death of your mother! No one can replace her place but Almighty can comfort your heart! May her soul rest in peace. My deepest sympathy to you and your family! I’m totally shocked by hearing the news of your mother’s passing. I think the mother is a special gift for us from Almighty! But man is mortal. I’ll be praying for you and the rest of your family! I’ll never forget the pretty face of your mother. She was a great lady. Accept my deepest condolence for the death of your mother! My prayers are with you during this time. Every mother teaches her child to be strong always. Because she knows that one day she’ll be gone. Today is that day. So be strong and follow every word which your mother taught! You have my deepest sympathies. In this sorrowful time I am at loss of words and thought to express my sadness about your loss. May God keep you in his embraces in this difficult time and give you the comfort and peace that you seek. Moms are always the special one for every single person. Your mother is one of the warmest and most caring people I had ever seen. God will keep your mother in a special place we pray! God is always near to those who have a broken heart. It’s really hard to bear the loss of someone so dear like the mother. But know that God is with you, He loves and cares for you. May you be comforted by the outpouring of love surrounding you. 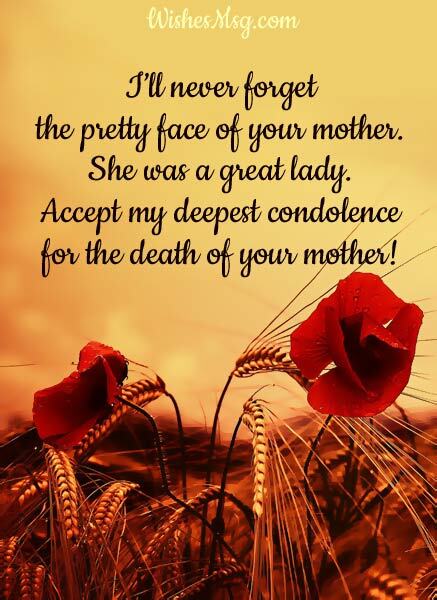 The gentle soul of your mother ascended to heaven, leaving behind a lot of memories and pain. Don’t just cry but keep her in your prayer! God will keep her in peace and bless her soul! I’m very sorry for your loss. I cannot imagine what you feel but I can have faith and hope for you and your family! May God give her eternal rest and put her soul where the righteous rest. My sincere condolences. I don’t know what do you feeling right now but I can say that God is always with you dear! Don’t be hopeless. Be strong always. May the comfort of God help you during this time of need. Dear friend, when something like this happened everyone getting depressed. I’m praying for your encouragement. Please accept my deepest condolence for your mother’s death! God see and know everything, my dear! Don’t be very upset. Just praying for the peace of your mother in heaven. Sorry for you such loss dear! My prayers and thoughts are with you during this dark time in your life. I know that your faith is strong and I wish you can hold it at any situation. I admire the life your mother lead. She was a great woman. I’m sorry for the loss of such a valuable one in your life! Mothers are the most valuable thing in our life. They are the blessing. Losing such kind of person is irreparable. Praying for your during the great loss! God bless you and comfort you. When I heard about your mother’s death I remind the time when my mother was with me. Don’t lose hope because our mothers protect us from far. Sorry for your extreme loss! 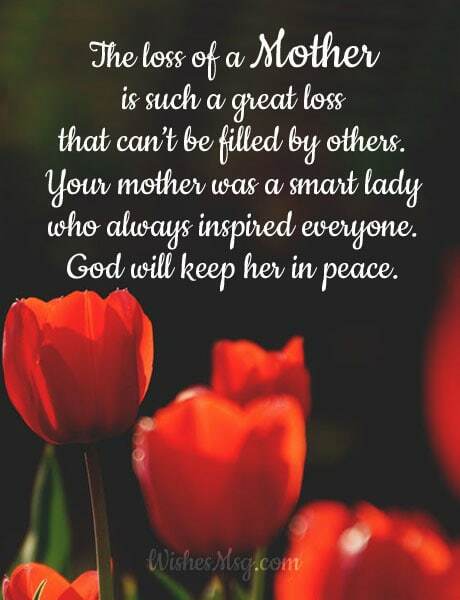 The loss of a mother is such a great loss that cannot be filled by others. Your mother was a smart lady who always inspired everyone. Surely, God will keep her in peace. Losing of your mother is like you lose a very close and loyal friend who always supported you, protected you and given the real meaning of life. Sorry for your loss! Not everyone gets to say that they had the world’s best mother but I’m sure that your mother was the best. Sorry for your valuable loss. I’m praying for you and your family dear! Your mother has a strong personality. She never thinks about failure. You are the child of her. So you have to go away with the strong mind. Take my condolence for your mother’s death! I think the lesson and teaching your mother give her child that’s enough for them. So it’s time to follow her guidelines in every moment of life. Stay strong! Caring thoughts are with you. Your mother is the best from inside to outside. Extending my deepest sympathy for your mother’s loss and praying for your fast encouragement. Lifting you up in prayer and wishing you peace and healing. As your mother is surely a great woman she will be missed by everyone who knows her. God bless you and your wonderful family dear! My heart goes out to you. Please accept my condolences. The loss of a dearest one is really so hard to bear. So, it’s your duty to give your grieving friend a shoulder to rest and courage to go ahead.